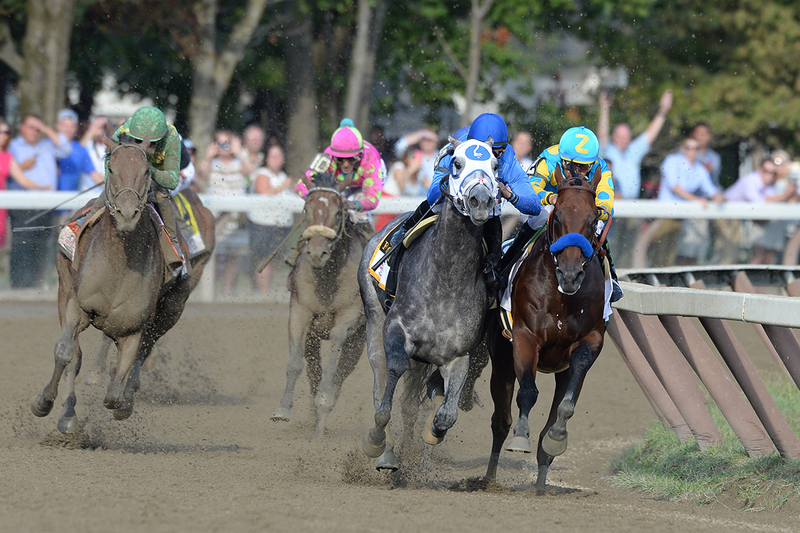 When did American Pharoah lose the Travers? He came out of the gate well and went to the front. So far, so good. He clipped off :12 second furlongs through the first half, just as he had in the Belmont Stakes. But he wasn’t alone. Frosted was to his outside, and as they moved down the backstretch, the gray pressed for more speed. Trakus records them as running the same time in the third quarter — an even :23 seconds. “Frosted is taking it to him,” called Larry Collmus. More than four lengths back, Keen Ice was matching their velocity. Espinoza claimed he felt Frosted’s chest hit his horse’s hip, and “he turned me sideways,” altering American Pharoah’s stride. Espinoza said Frosted hit him five or six times, though replays don’t bear that out. American Pharoah dug in and took the lead again. It didn’t look easy for the 1-5 favorite. It didn’t look as though he had much left. He had shown the same heart at Churchill Downs, fought to get past Firing Line in the final yards of the Kentucky Derby as Espinoza wildly asked him for more with reins and whip, but the reserve he had on the first Saturday in May was missing. It was Keen Ice’s day. The maiden winner had finished seventh in the Kentucky Derby, third in the Belmont Stakes, second in the Haskell. He was rising, and his rider, following trainer Dale Romans’ instructions to put him in the race, wasn’t about to miss an opportunity for a win. Keen Ice passed both to win the Travers by three-quarters of a length over American Pharoah in a final time of 2:01.57. The 16-1 shot paid $34. He didn’t, if Beyer or TimeformUS speed figures are your measure — he ran at about the same level he has been this year. Keen Ice was given a Beyer speed figure of 106 for the Travers, which would make American Pharoah’s 105, the same as he ran in the Kentucky Derby. TimeformUS rated American Pharoah 128 (Keen Ice 127), in line with his Derby 127. These horses, they will fool you. We tend to become so infatuated with them that we start to believe they are invincible, that all you need to do is put the saddle on them, turn on the ignition and watch them motor around the racetrack on their way to once again dominating those silly enough to get in the starting gate with them. We lose our sense of logic. But sooner or later, we find out there are no perfect horses. Forgive me a bit of redboarding. We were in our seats at Saratoga well before first post. Mr. Railbird, usually good for about three hours at the track, was considering a mid-afternoon stroll into town, and wondering, if he took that walk up Broadway, if he would regret missing the Personal Ensign. It was true. I could already see the finish, the head or half-length of another horse in front of Rachel Alexandra. I didn’t think it would be 21-1 Persistently, running in her first graded stakes race in two years, a result that I would only appreciate later — there’s an undeniable narrative satisfaction to the winning connections being those of the race’s namesake, dead this year at 26. It’s hard to let go of what was. A different horse, surely, but still tough and full of heart. With every loss this year have come more calls to retire the filly. What it is about losing that provokes this reaction? It says so much more about the human ego than it does about the horse, who’s hardly disgracing herself on track (even if it is a shame about the 95 Beyer speed figure in the Personal Ensign, ending her streak of 12 consecutive triple-digit Beyers). “I don’t want to give up on getting her back to where we were,” said trainer Steve Asmussen. And why should he? The Breeders’ Cup Classic is probably out, but with a record of two wins and three seconds from five starts, there’s no reason to think Rachel Alexandra can’t be competitive in the Distaff Ladies’ Classic. And still — as a friend emailed to say this morning — a hell of a horse. One of the more interesting juveniles running this summer is Theyskens’ Theory, a three-quarter sibling to 2005 juvenile champion Stevie Wonderboy and the first stakes winner for freshman sire Bernardini following her visually easy 1 1/4 length victory in the seven-furlong Prestige Stakes at Goodwood. The race was her third start; she won her second at Newmarket last month, going quicker than 3-year-olds on the same card. Too bad she doesn’t seem likely for the Breeders’ Cup, with trainer Brian Meehan saying that he plans to run ‘Theory’ once more this year, possibly in the Fillies’ Mile at Ascot, then shelve her until next spring. “When she strengthens over the winter she will be a top-class three-year-old.” Maybe Churchill in 2011, then? NYRA should embrace the Haskell — which is, after all, merely a prep race for the marquee event of the Saratoga meet, the 141st Travers Stakes on Aug. 28. Since the same all-star horses that face off at Monmouth on Sunday will renew their rivalry in the “Midsummer Derby,” NYRA should start beating the drums now. 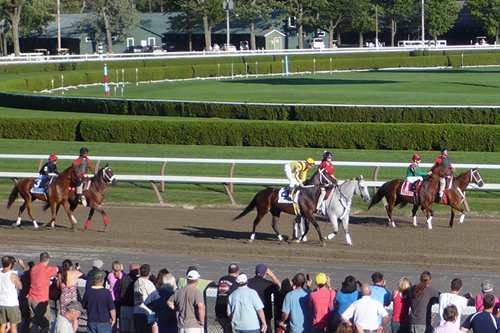 Advertise that the local fans can watch and bet on the Haskell at Saratoga on Sunday. Show the race on the infield TV screens. 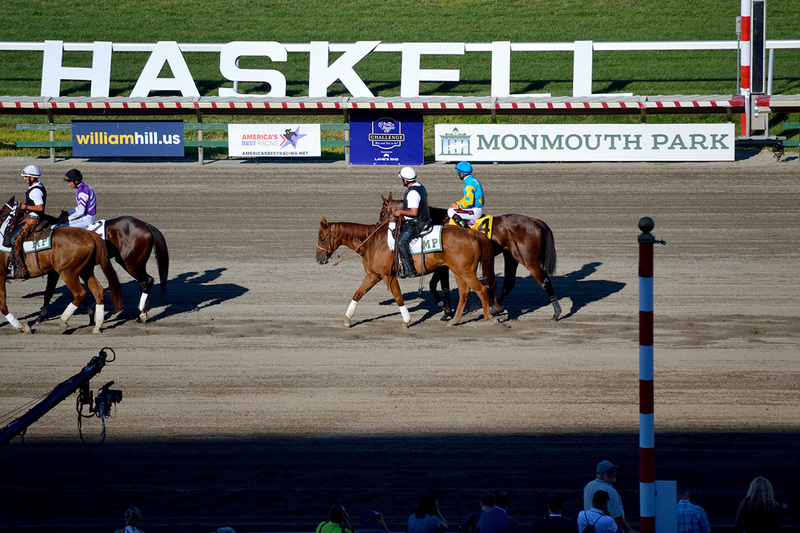 Turn the tables on Monmouth Park by using their signature race to promote yours. Especially if you’re NYRA, and you’re likely to win the numbers game: The test of Monmouth’s “elite meet” handle figures was always going to be the opening of Saratoga. Friday, when the Spa kicked off its 40-day meet, the New Jersey track took in $5,515,194, a decline of 20% from $6,898,633 the previous Friday, while attendance remained roughly the same. Sunday, Monmouth was down 11% compared to the previous Sunday. Saturday was the odd day out, as Haskell day will certainly be next weekend. With the Lady’s Secret and Rachel Alexandra featured, handle was up 25% and attendance up 37%, which tracked nicely with on-track handle, up 35% over the previous Saturday. At Saratoga, the first four days of this year’s extended meeting have been declared satisfactory: “Average all-sources handle, wagers on Saratoga races both on-track and from simulcast outlets nationwide, came to $12,834,190 daily, for a total of $51,336,758.” Attendance averaged 18,133 per day. Related: Steve Zorn offers a more comprehensive comparison.